Le’Veon Bell Breaks Steelers Playoff Rushing Record – Now Pause & Think about What that Means…. Going into the playoff loss to the Ravens in 2014 (2015, actually) Bell’s absence represented a loss of 34% of the Steelers total offense. It is harder to calculate the impact of Le’Veon Bell’s absence in the 2015 postseason because Bell missed the majority of the season injured or suspended. But it is quite possible that Ryan Shazier and Ben Roethlisberger’s late game heroics wouldn’t have been necessary against the Bengals had Bell been available to kill the clock in the 4th. In Pittsburgh’s wild card win against the Dolphins, Steelers Nation finaly got to see their “What IF” come true. So how did that work out? Le’Veon Bell ran 29 times for 167 yards and scored two touchdowns. In the process, Le’Veon Bell broke the Pittsburgh Steelers single game post-season rushing record. Let’s restate that: In his first post season appearance, Le’Veon Bell broke the Pittsburgh Steelers single-game playoff rushing record. Now consider what that really means. Had Le’Veon Bell broken this record, say, for the San Francisco 49ers, he wouldn’t have turned many heads, no disrespect to Roger Craig or Rickey Waters. But Le’Veon Bell broke the Pittsburgh Steelers playoff rushing record for a single game. This is the same franchise that has sent Jerome Bettis, Franco Harris and John Henry Johnson (you forgot about him, didn’t you?) to the Pro Football Hall of Fame. It is the team that gave Willie Parker, holder of the Super Bowl record for the longest run from scrimmage, his shot in the NFL. Watch the man. He’s got the oddest rushing style in football today. “The Great Hesitator,” Phil Simms called him on CBS, and that’s just about perfect. Usually, Bell lines up as the classic I-back, seven yards deep, and when he takes a handoff from Ben Roethlisberger, he’ll take a couple of jab steps toward a hole and almost stop in his tracks. Denver, under Mike Shanahan, had a one-cut running style; the back was told to hit up in the hole immediately—that charging into the hole was the one cut. Most coaches decry what they call pussyfooting. I find this amazing: Emmitt Smith, the all-time rushing king, gained 860 yards in his best seven-game stretch. That’s 142 yards less than Bell’s current seven-game run. So in other words, in the space of just 8 games, Le’Veon Bell broken a record set by one Steelers Hall of Fame running back that another Steelers Hall of Fame Running back couldn’t touch, and rushed for 142 yards more than Emmitt Smith rushed for during his best seven-game stretch. A little bit of research reveals that it’s not unusual for a Steelers running back to break the century mark in his playoff debut. Rashard Mendenhall, Bam Morris, Frank Pollard and Rocky Bleier also had 100 yard (or near 100 yard) performances early in their careers, but these came after their first post season game. I’ll never forget when Charlie Batch was here, he used to always tell me about how he would hand off and just watch Barry Sanders. I am not trying to put Le’Veon with Barry Sanders yet, but it is fun to sit and watch and just see what he is going to do because he is incredibly talented. So if you’re keeping track at home, in addition to outperforming 3 Steelers Hall of Fame running backs, Le’Veon Bell’s playoff performance against the Dolphins has now drawn comparisons to two other non-Steelers Hall of Fame running backs. During Le’Veon Bell took a lot of heat during his rookie season with a lot of journalists both inside (see John Stiegerwald) and outside of Pittsburgh doubting his ability. 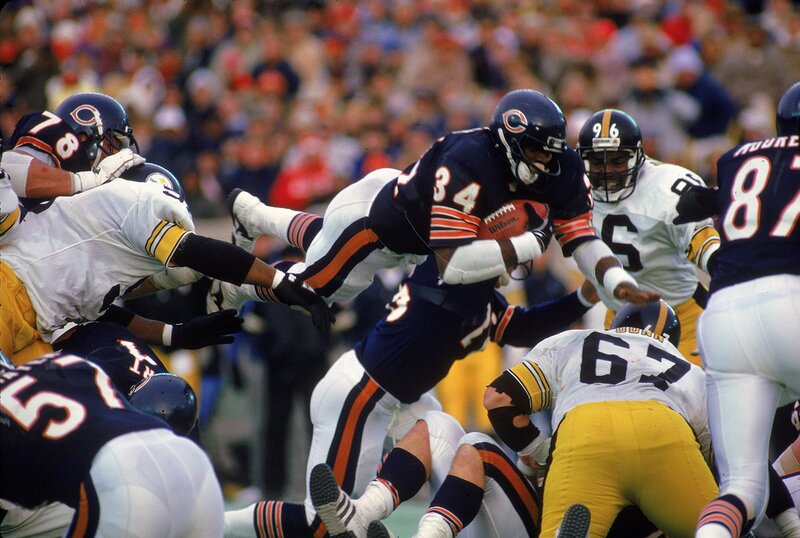 Steel City Insider’s Jim Wexell took the time to compare his game-by-game results to Walter Payton’s rookie campaign, despite getting needled about it on social media from some of his peers. Three seasons, a couple of injuries, 2 suspensions, and 1 playoff game later, Bell is getting the last laugh. As Ben Roethlisberger cautioned, it is still too early to categorize Bell alongside the Smiths, Harris, Sanders, and Paytons of NFL lore, but in Le’Veon Bell, the Pittsburgh Steelers certainly have a special running back. This entry was posted in Steelers 2016 Playoffs, Steelers History and tagged Barry Foster, Ben Roethlisberger, Franco Harris, Frank Pollard, Hall of Fame, Jerome Bettis, Le'Veon Bell, Merril Hoge, Rocky Bleier, Steelers running game, Steelers vs. Dolphins. Bookmark the permalink.